Author Raymond Grant’s newly released “Dialogue with Deity: Genesis and Jesus” is an examination of the conversations between God and man in the first book of the Bible. “Dialogue with Deity: Genesis and Jesus” from Christian Faith Publishing author Raymond Grant is an exploration of the interactions between God and His early people, and a comparison of these conversations with the contemporary social issues faced by modern Christians. “Dialogue with Deity: Genesis and Jesus”: a thought-provoking contemplation of biblical wisdom and its application in the world today. “Dialogue with Deity: Genesis and Jesus” is the creation of published author Raymond Grant, an essayist, exegete, and evangelist who has spent thirty years as a chaplain’s assistant in Oregon State Reform school and as many years as a high school teacher of Christian Apologetics and cultural worldviews (philosophies). Grant shares, “There are many aspects about the person of God that we are so curious about and wish we knew. Some of those questions that ramble about in the hallways of our mind will only be satisfied in eternity. However, there is one thing for certain that can be known from the get-go. God is a talker! He is an eloquent communicator, and He loves to dialogue with His creation. From the first book of the Bible onward, God verbalizes His will, expectations, and love with mankind. Published by Christian Faith Publishing, Raymond Grant‘s new book is an engrossing exploration of early humankind’s dialogues with God as revealed in Genesis. View a synopsis of “Dialogue with Deity: Genesis and Jesus” on YouTube. Readers can purchase“Dialogue with Deity: Genesis and Jesus” at traditional brick and mortar bookstores, or online at Amazon.com, Apple iTunes store, Kobo or Barnes and Noble. 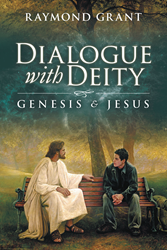 For additional information or inquiries about “Dialogue with Deity: Genesis and Jesus”, contact the Christian Faith Publishing media department at 866-554-0919.